The magnificent mughul capital at Fatehpur Sikri was built by the greatest of all mughuls , emperor Akbar. The complex is located near Agra city in Uttar Pradesh in India. The story goes that Akbar was blessed with a son, who was to become emperor Jahangir in the coming years, after offering prayers to the revered sufi saint Salim. He then shifted his capital to Fatehpur because he believed it to be lucky for him and his empire. The construction of the complex was started in 1571, but in 1584 it had to be abandoned, most probably due to shortage of water. 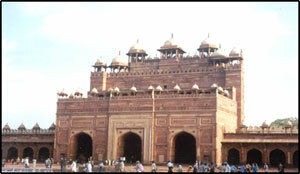 Fatehpur Sikri is a World Heritage site, and is one of the most important tourist destinations in Uttar Pradesh. Tourism in Uttar Pradesh benefits immensely from Agra and Fatehpur Sikri as they are one of the most famous historical sites in India. The Agra gate � this is the entrance to the gate. Facing Agra, this gate is typical of the gates in all mughul forts. Imposing yet intricate, this gate sets the tone as one enters the complex through it. Naubatkhana � this was the drum house from where announcements were made upon important arrivals. Diwan-i-am � this structure greets visitors once they enter the complex. This used to be the place of the daily durbar, or public audience. The seat of the emperor is enclosed in an elevated area. Beautiful gardens surround this structure. Diwan-i-khas � this spectacular structure, sometimes also called the jewel house, is the first thing that meets your eyes as you enter the inner complex. The highlight of this structure is the beautifully crafted red sandstone column topped by a throne and joined by ramps to the four corners. Birbal�s house � the house of Birbal, the favorite minister of Akbar, is an interesting structure with horizontal sunshades depicting traditional contemporary styles. Jodhabai�s Palace � Said to be the private quarters of the Hindu wife of the emperor, this is an entire complex in itself. The open courtyard leads to the inner chambers. The interesting features of this building are the concealed seats perched at a height to enable the women to observe the outer courtyard without being seen. Pachisi court � Pachisi is an ancient board game, very popular among the royalty of the medieval ages. This court is unique as it is said that people used to act as pawns and moved over the court following the players� instructions. Panch mahal � this magnificent structure towers over the complex, and is one of the most beautiful mughul structures ever built. Opinions about the exact purpose of the building vary. The five stories go up in steps, the area decreasing with each step. A panoramic view of the entire complex can be seen from the top of the Panch Mahal. Buland Darwaza- this gigantic doorway was built by Akbar as a memorial to the conquest of Gujarat. The door is decorated with intricately painted Quranic verses, and a large number of steps go down from it on the outside of the complex. Salim Chisti�s tomb � the tomb of the sufi saint Salim is a pious spot within the complex. The building is one of the best examples of mughul architecture in India. 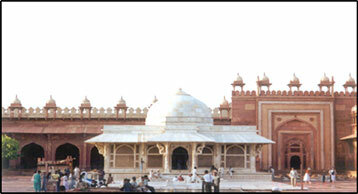 Touristplacesinindia.com offers all inclusive information about Fatehpur Sikri in Uttar Pradesh and other tourist places in India.